À votre santé. Drink to your health, the French say. If you are a food lover or a wine lover, you’ve almost certainly heard of the famous “French paradox.” That the French can eat such rich foods and have better cardiovascular health than Americans has been ingrained in the common wisdom for decades. Over time, scientists began to study this phenomenon and several highly-publicized studies pointed to the consumption of wine as a key component to this paradoxical lifestyle. Since then, it has become a part of the accepted thinking that wine, and particularly red, is good for your health. It seems like not a day goes by without articles arising in the media entitled “Wine helps cardiovascular health” or “Wine helps arthritis sufferers” or other paeans to the panacea of wine. Research has targeted three components of wine as helpful molecules: (1) polyphenols found in grape skins (e.g., tannins and color compounds known as anthocyanins), which are higher in red wine due to prolonged skin contact, (2) the molecule resveratrol, shown to extend lifespans in mice in spite of their being fed a high-fat, high-calorie diet, and (3) moderate consumption of alcohol itself. The health benefits that show up in these studies may seem so profound that some doctors are considering recommending a glass or two of wine per day. It may seem odd, then, that wine advertisements and wine labels rarely even mention these results. Why don’t U.S. wineries publicize these health benefits? Why can’t wine make claims about its benefits to cardiovascular health? At first glance, one would think that the lack of health claims is a holdover from our puritan roots, where any labeling that would encourage alcohol consumption is verboten, especially given the draconian GOVERNMENT WARNING label that must appear on all alcoholic beverages. In fact, health claims were banned until relatively recently. Wine labels in the U.S. are regulated by the Tax and Trade Bureau (TTB). Every label that goes on a bottle of wine to be sold in the U.S. must be approved by TTB, and many regulations exist controlling what can and cannot be on a label. In 1999, the Bureau of Alcohol, Tobacco, and Firearms (BATF, the predecessor of TTB) allowed a “directional statement” to be printed on labels for the first time. These statements, including “consult your family doctor about the health effects of wine consumption” were subsequently rejected following pressure from then-Senator Strom Thurmond, who threatened to block Treasury Department appointments until the language was redacted. In 2003, in light of mounting evidence and lobbying from the trade group The Wine Institute, TTB amended the rules to allow health claims on labels, with the stipulation that they be heavily qualified. Under the current regulations, health claims must not be misleading. A health claim is defined misleading in the following way (emphasis mine). 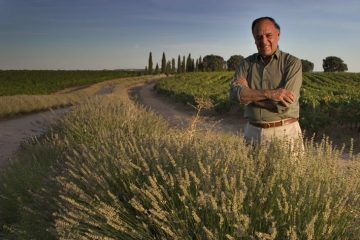 In effect, wineries may talk about health claims on labels or in advertisements, but it’s a giant pain. Any claim that “moderate alcohol consumption improves cardiovascular health” must immediately be followed by statements about the risks of alcohol consumption and an assertion that certain people should not drink alcohol at all. Reading this, you might think that, again, the government just doesn’t want to encourage people to buy alcohol on principle. However, a closer look at the 32-page decision (available here) shows that TTB has considered many sides of the issue and found that while scientific studies do show a link between wine consumption and health, these links are, to date, inconclusive. Recent articles in the New York Times and San Francisco Chronicle state that scientists have begun to call into question health claims of moderate wine and alcohol consumption, and rightfully so. Another issue entirely is whether the across-the-board correlation between moderate drinking and health implies causation, or if socio-economic factors are more important in these studies (i.e., wine drinkers are more affluent overall, and therefore have greater access to health care, healthier lifestyles, etc.) 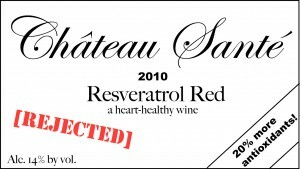 Resveratrol has been shown in laboratory studies to mitigate chemical processes underlying many diseases, but many of these studies have been done in mice or outside of living organisms, and without many more clinical studies it’s impossible to say if the effects carry over to humans. Polyphenols have been shown to affect the formation of cholesterol plaques, but only when consumed with foods rich in compounds that contribute to plaque formation. In light of this, labels should have to tell both sides of the scientific story. This isn’t just true for wine either. General Mills was recently chastised by the FDA for claiming that Cheerios could lower cholesterol. While there is a study that supports the claim that whole grain foods rich in soluble fiber contribute to lower cholesterol, claims like this one must be thoroughly vetted in human clinical trials and anything that claims to treat a disease is classified by the FDA as a drug. Thus, not even foods can claim to treat disease, let alone alcoholic drinks. TTB defers to FDA to regulate some claims on wine labels, so any claims in labeling or advertising that would imply that wine can treat disease would likely never be approved. Consumers (and human beings in general) long for simple directives. Eat this, don’t do that, and you’ll live to be 100. Many sensationalist headlines are worded in this way (e.g., “A glass of medicine, please…”). It would be great if things were that simple, but biology, and especially human physiology, is exceedingly complex. Scientists don’t have all the answers and we’re not even close. Given the consistently proven health risks of alcohol abuse, recommendations hinting at the health benefits of alcohol are certainly to be made carefully, and there just isn’t enough information yet to make them confidently. In light of the uncertainty of the studies’ conclusions and the real estate that any health claims would take up on a wine label in order to be approved, it’s probably best that wineries continue to let the media do their advertising for them. Publications seem all too eager to publicize the latest studies that might extol the benefits of red wine (for example, the several pages devoted to studies about wine’s health benefits in Wine Spectator a few months ago). Many publications, aiming to make the topic accessible to the public, can drastically oversimplify the message. Finally, the fact that wineries would desire to market wine as healthy instead of as a delicious, complex, pleasurable beverage is interesting in itself, but probably better left for another article. Very interesting read. While it would be nice to allow wineries to talk more openly about the health benefits of wine, I agree that it is fragile tight rope to walk. When I was doing research for the Wikipedia article on Wine & Health http://en.wikipedia.org/wiki/Wine_and_health I saw how difficult it was to make any definitive statements. For every study that showed a health benefit, another study showed an increased risk factor and so on. In the end, I think most people should drink wine because they enjoy it–not because they’re expecting a magical pill. How about labeling noting that if you enjoy a glass of wine with your meal it lessens the risk of food poisoning..etc. apparently this thread is a magnet for spam comments. I should have known not to mention the R-word. Or even the H-word! alchohol abuse would always lead to liver cancer if not properly treated .. I read your article very much.